As Kate is back in the Hospital I am sacrificing more sleep time. Many have wondered why I have said things, there was no word from Eric or anyone at Seti. Well I was told things that were in confidence and went to work on Donations. Many ignore me as I keep posting the "same Cr@p about Donations." Sorry, but I have invested a lot of Time, Computer Time, Effort and Helping others with Seti. It is something that I believe in. Many of you are buying New Computers so that you can do More Faster and Beat Out the other Person. Seti has had the most stable and consistent source of credit/hour. However, with the Thousands that you are spending on new computers and then can not find a reason for a small Donation. It makes No Sense! I know that everyone would like to see more information, Tuesday I was fortunate enough to have Coffee with Eric in Seattle (Eric was attending a convention up here). As he is flying out of the Cold (up here) should be back to California this evening. Over the next couple of days you should be seeing some information about MultiBeam and plans for the migration to Seti Main. As a result of many Users providing feedback about communications, a new feature has been added to the Seti Forums. This would allow the Seti Staff to post in a common place and make it easier to look at feedback from many of the Users. So in part you have to Blame "Me" rather than "Misfit" and when I discussed it with Eric it sounded like a good idea. It opens many Positive Possibilities! While some might say that with other things that should be more important why take time to create something new. I have to say it was not programmed by a member of the Seti Staff, it was completed by Rytis as part of the BOINC Project. He completed this in and around "Finals." So with it's success or failure, it may be implemented in many of the BOINC Projects. Time will tell. I want to Thank the Many Users that have taken the time to provide feedback and information, it does get to Seti! 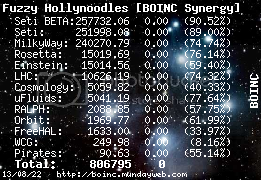 Pappa Tips his Hat to Rytis and the BOINC Crew! 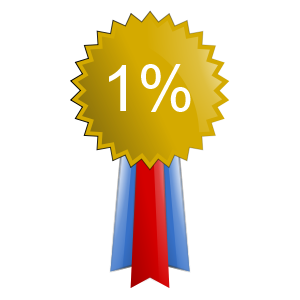 As of [26 Jan 2007 1:14:42 UTC] $109570.92 or 20.3% of the goal. I do have to note that over the last couple of days there have been no Donations. A reminder that Operations (including Internet Connectivity) cost roughly $630+/day. So beside Server Issues just keeping the door open is Important. That would buy time to find other resources if they can be found. Many people have asked about what is happening in the background one of the most informative posts was done by Matt in the Blog's So where's the science..?. So once again, we all need to look to see what each of "us" can do, that is all we can ask. Message 513907 - Posted: 6 Feb 2007, 5:20:38 UTC - in response to Message 513895. Message 514222 - Posted: 6 Feb 2007, 21:24:08 UTC - in response to Message 513895. A huge thank you to all who have donated. As of [9 Feb 2007 23:49:04 UTC] $163069.92 or 30.2% of the Goal has been Raised. As You can see that is almost 1/3rd of the Goal in a little over 2 months. Simon has completed the Seti PayPal Gateway that allows those previously wishing for it the chance to help. If you enter your Account Number (found towards the bottom of your account page) You can also have a green star... If you desire to make unvisible you can turn it off also from the account page. Team Founders/Captains Please take time to let your Team Members Know. Team Members you might need to let You Team Founder/Captains know that the PayPal Gateway is ready. * Eric has Complete Access to the Account. * What goes into the account comes to Seti. Message 516098 - Posted: 11 Feb 2007, 6:15:35 UTC - in response to Message 515491. Simon has completed the Seti PayPal Gateway that allows those previously wishing for it the chance to help. So it's the right time to correct the Paypal notes on the main SETI@home Donation page accordingly. Message 516209 - Posted: 11 Feb 2007, 14:49:11 UTC - in response to Message 516098. I sent an email to the address at the bottom of the page requesting an update. I hope it works. I want to extend My Personal Thank You, to Everyone that has found some way to find a few dollars to Help Seti Survive. When You Can it is Still Needed! As of [20 Feb 2007 4:02:52 UTC] $164493.13 has been raised or 30.6% We have seen vaious pieces of hardware show up and Seti and a few items still outstanding. I will update what Information I have in the next couple of days. Message 521351 - Posted: 22 Feb 2007, 2:29:36 UTC - in response to Message 520890. Please go take a look to see if You can Help! For those that have Donated Parts, Thank You! Message 522677 - Posted: 24 Feb 2007, 14:17:49 UTC - in response to Message 521866. Pappa: what do you need from Dell? I've got contacts in all levels over there. Message 522701 - Posted: 24 Feb 2007, 16:00:42 UTC - in response to Message 522677. Message 523664 - Posted: 26 Feb 2007, 15:18:11 UTC - in response to Message 516098. PayPal users: We now have a team working with us to accept PayPal donations. You can donate by going here. PayPal does take a small percentage, so if you can donate directly, we get more of your donation. But if PayPal is the only way you can donate, by all means use it. There may be a delay of up to a week between when the donation occurs and when the star appears next to your name on the web pages. Message 523698 - Posted: 26 Feb 2007, 18:11:59 UTC - in response to Message 523664.
eh - you still 'ave it set-up so that one can NOT 'ave the STAR showin'? right? Message 523895 - Posted: 27 Feb 2007, 1:12:11 UTC - in response to Message 523698. Sorry, Richard, if you asked me, I do not understand your question.